The Army's budget reflected its fragmented organization. There were twenty-five major "projects" or appropriations classifications based upon the technical services, each with its own individual budget, which accounted for 80 percent of the funds spent by the Army. (Table 1) Neither the Secretary of the Army nor the General Staff possessed any effective control over these funds. Congressionally oriented procedures for spending and accounting for appropriated funds also made financial control difficult. The Army's various accounting systems only told Congress how much of the funds in any appropriation had been committed or obligated, not how much had been actually spent or when. They contained no information on what happened to mat6riel or supplies after their purchase. The existence at all levels of command of unfunded obligations, principally military pay, and expendable items were added impediments to rational financial control. Congress emphasized the independence of the technical services in its traditional restrictions on transferring funds among major appropriations categories. Technical service chiefs could and did transfer funds freely among their various activities, functions, and installations, but neither the Secretary nor the General Staff could legally transfer funds among the several technical services or other staff agencies without going to Congress for approval. Given these conditions there was no rational means of determining how much the Army's operations cost, no means of distinguishing between capital and operating expenses in most instances, and no means of determining inventory supplies on hand. Repeated requests for deficiency appropriations each year made even control by Congress over spending difficult. Source: Cresap, McCormick and Paget Final Report, 15 Apr 49, p. III-17. system had broken down. The Army and Navy budget structures were antique. "They represent an accumulation of categories arrived at on an empirical and historical basis. They do not permit ready comparisons, they impede administration, and interfere with the efficiency of the Military Establishment. Congress allocates billions without accurate knowledge as to why they are necessary or what they are being used for." Both Hoover and Eberstadt agreed that the efficient operation of the Defense Department required a complete overhaul of the military budget structure and its procedures and fiscal policies. Title IV of the National Security Act amendments reflected the recommendations of the Hoover Commission and the Eberstadt Committee on financial management. Section 401 established the Office of Comptroller in the Department of Defense and delegated broad authority to him over the financial operations of the department. The Comptroller was to direct preparation of the department's budget estimates, including the formulation of uniform terminology, budget classifications, and procedures. He was responsible for supervising accounting procedures and statistical reporting. Section 402 provided for comptrollers in each of the three services responsible directly to the service secretaries and acting in accordance with directions from the Defense Department Comptroller. The fiscal, administrative, and managerial organization and procedures of the several departments, it declared, should be compatible with those of the Office of the Defense Department Comptroller. Performance budgets meant nothing until the new Department of Defense Comptroller identified what functional budget classifications to adopt. The first Comptroller of the Department of Defense was Wilfred J. McNeil who remained in this position for a record ten years. He was intimately familiar with defense budgets and financial practices as de facto Comptroller of the Navy since 1945, following similar service in uniform during World War II. He helped Mr. Eberstadt prepare his report on military financial management and participated in drafting Title IV of the National Security Act amendments of 1949.
tion, research and development, military construction, army national guard, reserve personnel requirements, national guard military construction, and army civilian components. The Army's functional budget was similar to those developed in modern industrial corporations to control their operations. It told in detail what it cost to support the Army in terms of men and material resources. It did not reveal the other side of the picture, the cost of the Army's operations at home or abroad. It did not reveal the gap which had grown, as General Marshall had warned, between American military commitments and the resources available to meet them following World War II. 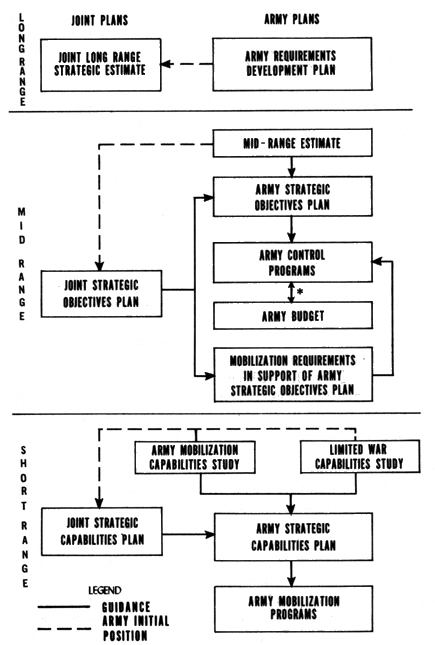 To close the gap both the Hoover Commission and Cresap, McCormick and Paget had recommended the development of an "Army Program System" that would translate strategic plans into functional operating programs which in turn could be translated into the new functional budget. Translating these theoretical concepts into action required time to adjust and revise operating programs in practical terms to reflect planning missions at one end and at the other to relate as closely as possible to budget classifications. It also took more time to educate all levels of the Army in the mechanics of the new system. Korean armistice in July 1958 that any attention could be paid to developing the new Program System. * When the initially developed budget undergoes a subsequent change resulting from decisions by higher authority, these changes are reflected through a corresponding revision of the control program. Source: FM 101-51, DA, 10 Oct 57, DA Planning & Programming Manual, p.16. available funds. The Secretary of Defense continued to make decisions on budgets, particularly budget reductions, without adequate knowledge of the impact these decisions might have on U.S. military capabilities. He allocated funds in bulk to each of the three services which made further allocations within their own departments in accordance with their own priorities. Joint operations frequently suffered, notably when the Air Force could not provide the Army with military air transport. Another reason for the disparity between Army plans and budgets was that its programs were rarely completed in time to be incorporated into current budget requests. Since generally the organizations or agencies responsible for developing programs also prepared the Army's budget estimates, the pressing requirements of current operations hampered program planning for the future. This handicap continued despite repeated revisions of the Army Program System. Source: AR 1-11, 17 Jan 58. "where economy consistent with operational efficiency will result." According to some critics the Air Force interpreted "operational efficiency" as requiring a completely separate supply system regardless of duplication and overlap. The principal champions of integrated supply systems were to be found in Congress and the business world, not in the military services. Under constant prodding from the outsideby Congress and the two Hoover Commissions-the movement toward increased co-ordination and integration of service supply systems gained momentum between 1947 and 1960. The impact on the Army's technical services was considerable. Meanwhile, in 1948, Congress passed the Armed Forces Procurement Act, requiring the development of uniform procurement procedures for all the military departments. The main purpose of the act was to free the military services from the prewar requirement that all procurement in peacetime be by open competitive bidding, a requirement that was impractical in many cases. The act spelled out specific requirements that must be met to justify negotiated contracts. To carry out the purposes of the act a special committee drafted a set of Armed Services Procurement Regulations (ASPR's) that became, with their periodic revisions, the bible of procurement procedures for the Department of Defense. The First Hoover Commission report in 1949 did not, as the second report was to do, recommend a radical alteration of the DOD logistics structure. However, it did recommend that ". . . the National Security Act of 1947 be specifically amended so as to strengthen the authority of the Secretary of Defense in order that he may integrate the organization and procedures of the various phases of supply in the constituent departments of the National Military Establishment. "25 The provisions of the National Security Act amendments in 1949 concerning the establishment of performance budgets, stock and industrial funds, and cost-of-performance accounting made greater integration of defense activities possible. The stock fund principle introduced in the Army as a result-the Navy had long had one and the Air Force was never to use stock funding to any considerable degree-greatly facilitated cross-servicing and provided a mechanism for the later operation of single managers. ment and quietly agreeing among themselves to emphasize separatism rather than integration. The military services opposed a civilian common supply agency even more than a military one. They charged it would be less responsive to military requirements and so jeopardize the success of military operations. An Army staff study, The Fourth Service of Supply and Alternatives, prepared in the Business and Industrial Management Office of the Office of the Deputy Chief of Staff for Logistics in September 1955 followed this line of argument. The Hoover Commission and its Task Force on the Business Organization of the Defense Department, it said, did not give adequate attention to the military aspects of military supply management. They emphasized peacetime operations. The Task Force's assertions concerning the inefficiency of military supply management were based on "unsupported assumptions." managers and service troops. Recruiting civilian supply personnel in wartime or for overseas services was also undesirable. In conclusion the Task Force said that a civilian "Fourth Service of Supply" would impair the Army's ability to carry out its assigned military missions. Congress did not appear as impressed with the argument of military necessity as it was with the Hoover Commission's indictment of waste and inefficiency in the military services. To avoid having Congress take the matter away from the services entirely, the Department of Defense did an about face. A prime mover in bringing about a more favorable attitude toward greater integration in supply management was the new Deputy Assistant Secretary for Supply and Logistics, Robert C. Lanphier, Jr., a Midwestern electric and utility company executive. Beginning in late 1954 a task force in his office spent several months exploring how best to achieve a maximum degree of integration with a minimum of disruption to the existing service organizations. The solution proposed and approved by the Secretary of Defense was to appoint "Single Managers" for a selected group of common supply and service activities. tional pattern on the existing one instead of creating a new organization. When the concept was presented to the Secretary of Defense and the services the Navy, adhering to its traditional opposition to integration in any form, opposed it on principle. A new Deputy Secretary of Defense for Supply and Logistics, Reuben B. Robertson, Jr., a paper company executive who had served as vice chairman of the Second Hoover Commission's Committee on the Business Organization of the Department of Defense, overruled the Navy's objections and approved a directive outlining the procedures and principles to be followed in setting up single managerships. Under this directive the Secretary of Defense would formally appoint one of the three service secretaries as single manager for a selected group of commodities or common service activities, and he, in turn, would select an executive director to operate the program. Single managers in the Army were established within the existing technical service organizations. The Secretary of the Army designated a major general as executive director who served under the chief of the technical service responsible for the particular type of commodity or service involved. The Single Managers for Subsistence and for Clothing and Textiles operated under the Quartermaster General, while the Single Manager for Military Traffic Management was under the Chief of Transportation. The responsibility of the single managers for determining requirements involved common cataloging and standardization as well as inventory control. They operated under a stock or consumer revolving fund, buying what they needed, selling to the military departments and consumers, and using the funds paid to replenish their stocks. This eliminated the expense and delay in calling for open bids each time supplies were requested. Through their control over wholesale storage they were able to direct distribution to consumers from the nearest depot, regardless of the service operating it, in such a manner as to avoid the needless and expensive cross-hauling involved when each service maintained its own completely separate distribution systems. normal command channels, reporting to the Secretary of the Army through the chiefs of the technical services and the Deputy Chief of Staff for Logistics, who was assigned Army staff responsibility for the single manager programs. The impact of losing control over their inventories was minimal because this was a function the technical services had never chosen to exercise effectively. They continued to calculate their own requirements, and they retained their own wholesale and retail distribution systems. The chief difference was that they operated their wholesale depots now as agents of the single managers rather than the several technical services. In sum, the single manager concept balanced demands for greater integration of supply management with the military services' insistence that effective military operations required each service to maintain its own independent supply system. Congress continued to scrutinize defense supply management and to demand further integration. areas-strategic planning and the direction of military operations, financial management, logistics, and research and development. The first substantial increase in the authority of the Secretary of Defense and the Joint Chiefs of Staff came with the passage of the National Security Act amendments of 1949. The Secretary of Defense's increased authority over defense budgets, calling for their reorganization along functional lines, was perhaps the most significant change. At the same time the Secretary's civilian staff and the joint staff serving the joint Chiefs of Staff were also increased in size. The Eisenhower Reorganization Plan No. 6 of 1958 brought about further increases in the authority of the Secretary of Defense and the Joint Chiefs. The various functional boards set up under the 1947 act, stymied by interservice rivalry, were replaced by a series of functional assistant secretaries with authority to act on behalf of the Secretary. The civilian staffs of the service secretaries were also reorganized on functional lines, reflecting the changes within the Office of the Secretary of Defense. The joint staff was again increased in size and the chairman of the joint Chiefs given greater authority over the joint staff's operations. Congressional prodding and Soviet technological achievements led to the Defense Reorganization Act of 1958 which centralized authority over the services in the Secretary of Defense and his office even further. The chain of command over military operations was changed to run from the President and Secretary of Defense through the joint Chiefs rather than through the service secretaries who had acted as executive agents since 1953. The JCS, its staff doubled to four hundred, was completely reorganized along conventional military staff lines, replacing the system of JCS committees, most of which were abolished. The authority of the chairman of the joint Chiefs of Staff over the joint staff was increased, and at the request of President Eisenhower he was given a vote in JCS decisions previously denied him by Congress. This increasingly centralized control by the Secretary and the Department of Defense obviously diminished the role of the services. They had become support commands, responsible for training, administration, and logistical support of military operations, limited further by the authority of the new Director of Defense Research and Engineering over the development of new weapons.